So far I’ve received three Awards for “Sea Horse, run!”. for Best Children’s Picture Book. The Independent Book Publishing Professionals Group established the award in 2008 to recognize and honor the most exceptional independently published books of the year. Winners receive a cash prize, a gold medal, and publicity with national news media and events. (Click here to learn more about the award or enter your book in the contest.) 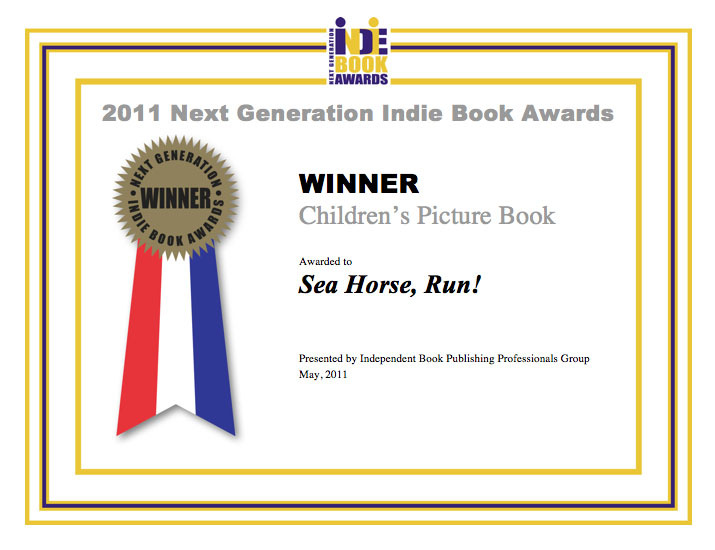 Thank you IBPPG for choosing “Sea Horse, run!” as a 2011 WINNER!!! Visit the Next Generation Indie Book Awards site. Learn more about the Award on Wikipedia. “Like” the Award on Facebook. (sponsored by USA Book News).